One of the most important success factors of Beer Chang has been effective marketing management, and its vision to organize groups of beer marketing companies to market beer and non-alcoholic marketing companies. Effective marketing management potentials have been the results of the experience of the executives, fast and efficient coordination, and over 4,000 marketing personnel who are highly specialized in beer marketing and can respond to consumer demands with speed covering all national areas. They have 90 distributing branches scattered in all areas of the country. Areas under Beer Marketing Group can be divided into two zones, under 8 small firms. 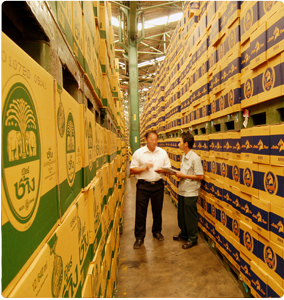 They market and distribute Beer Chang, in bottles, big and small, cans, and in casks for draught beer; drinking water under Chang brand; and Chang soda water.